Vegan haircare is becoming all the buzz with the latest spike in plant-based interest, especially since the beginning of 2019! I am no stranger to this trend since I’ve been on the search for a perfect vegan hair routine after a few years of pursuing plants. I have also been under the care of a “hair-apist” since the 7th grade and am no stranger to hair salon’s, stylists, and how to achieve beautiful hair. Traditional Texans are known for their big hair and I quickly allowed it to become my aspiration to achieve bold, beautiful locks. From those early days in the chair, after learning how good hair comes at a price & patience most people wouldn’t have capacity for, I’ve come up with a serious list of “do’s & don’t’s” that any can be successful at. Patience (in hair-care) is a much needed virtue if you’re going to pursue beautiful locks. Get to know your hair. Is it thick? Is if fine? Does it feel brittle? Is your environment affecting it? These are all good questions to start asking when you’re deciding on where to go because you want your stylist to KNOW your hair. Every single time I’ve sat down in a stylist’s hair for the first time, I become my own advocate in letting them know the history of my hair & where I want it to be. Also, if you’re walking into a salon asking for brown to platinum blonde or fashion color, it’s not going to happen over night! That’s the point. If you want a soft, flowing head of hair, you’ve got to understand that it’s going to take work to get there. Becoming your biggest hair advocate while sitting in the chair is the best thing you can do for your noggin. Over time, after figuring out what is best for my body, I’ve been able to communicate more clearly what my hair needs to thrive! Sometimes this may not even be what your salon has in stock. Do their products on hand make your head itch? Does your scalp react once you step foot out of the salon? Then maybe it’s time to check out what your stylist is using in your head. You’re going to be giving power to someone who has to ability to make or break the status of your hair. With that, find someone you are going to enjoy seeing! Salon time is self-care time, so make sure that you’re sitting in someone’s chair that makes you feel comfortable. Believe me, most salon stylists want to enjoy their clients, so giving yourself that is the best thing you can do for the both of you. Luckily I have found an amazing artist right here in Colorado who has helped me accomplish my current #hairgoals: Rebel Hair Artistry at Revolver: A Salon on Steele Street. How did I find my stylist? After going to several salons in the area & being disappointed with prices & appointment selections, I was recommended to Lindsay, who not only understand’s fashion color, but understands how important it is to me that the products I am using are friendly to animals, my body, & the environment. Check out her work on Instagram & check out the cruelty-free Kevin Murphy products (pictured above) her salon keeps stocked. Got more vegan hair tips people should know about? Leave a comment below! One of the biggest challenges I’ve had in this plant-based lifestyle change has been an increased sensitivity to personal care products that contain heavy chemicals or ones that included animal products in their formulas. I’ve even had reactions to claimed vegan & cruelty free products which allowed me come to terms with the fact that I needed to do a beauty overall. It wasn’t a big deal at first, but 3 years later after a lot of damage control, my vessel has become the “cadillac” of bodies, as I found out a few months ago that EVERYTHING I’d been using on my face (from personal care to makeup) was causing my skin to react in a not-so-pretty way. That’s when I decided to ditch everything I had been using (including the makeup brushes) and start from scratch. FINALLY-- I have found some products (both Brandon and I use) that have met up to the standards our bodies have been always asking for. So with that, here is the ever growing & changing list of things I am using every single day that might benefit you as well. Eh oh... this is a controversial one for some, but this has been a longtime, useful, and simple addition to my routine for several years now. It’s not only the simplest makeup remover, but it cleanses and keeps my face moisturized at the same time. If you’ve done the research and feel confused about whether or not coconut oil is beneficial, I say try it out for yourself and see what happens. Some people can’t and shouldn’t use this due to their skin-type, so make sure you know what skin combination you have before you start slathering coconut oil everywhere. I would consider my skin as a sensitive-combination type. This just means I’m sensitive to everything while it can be dry and/or oil. Read this Elle source about why Coconut Oil can be good for your skin. I recently fell in love with this Colorado-local line at an event where we were able to test-drive the recommended facial routine. It was the first time I felt comfortable after using this bar of soap in Colorado because of the dry weather’s nack for sucking the moisture out of everything. Most soaps would dry out my skin immediately after use. First of all, the Osmia Rose Bar has helped clear up the redness around my cheeks and has helped to detox my skin from chemical build-up from my previous beauty routine. Second of all, it feels gentle going on and going off, and it doesn’t leave residue. I use this in the morning to freshen up my face followed by my next few products. This has been in my husband and I’s routine for a little over a year now, and I got to say that I’m glad I found it. The hubby uses it on a cotton pad and wiping off the excess oils and dirt and I use it in the same way, but not everyday. These “Unicorn Drops” have been a skin-saver with this naturally dry Colorado air. No, I do not use a moisturizer with these drops because the oil combined with more oil adds too much to my face, so I use it a different way than what’s probably recommended, but hey it works for me. Using the Witchhazel Toner, I squeeze 7-8 drops in my hand, then add 2-3 of the Vital Rose drops with it. That’s when I mix the two together by rubbing my hands together and pat the mixed combination with my hands on to my damp skin (this is after washing my face). Why do I mix the liquid and the oil? Well, from what I’ve learned, the water-base allows the oil to activate and to be easily absorbed into the skin. It’s worked for me and my face doesn’t dry out like it did when we first moved here. In fact, it stays smooth all day. P.S. This same brand also has one of the best lip balms I’ve ever used. Brandon and I usually keep one of these in our car and use it frequently! It doesn’t make you wanting more and more like Chapstick or Burt’s Bees, and it feels like lip balm should. I actually got to meet the creators of this amazing product line at the same local event I found Osmia Organics. It was Joanne & Gregs hands-on story paired with their demonstration & expert experience that inspired me to give these products a try. Something mentioned, after the Joanne’s personal story about her daughter’s reaction to drugstore products, was that the the products we use for washing our hair should be the MOST clean, as chemicals & other ingredients can be absorbed into the bloodstream through the skin. I had been struggling to find a product with a creator who understood how valuable & important that concept was, and I was tired of being “sold” on network marketing products I had seen & heard negative reactions from. Innersense stands for “we can do better,” and that’s just my style. 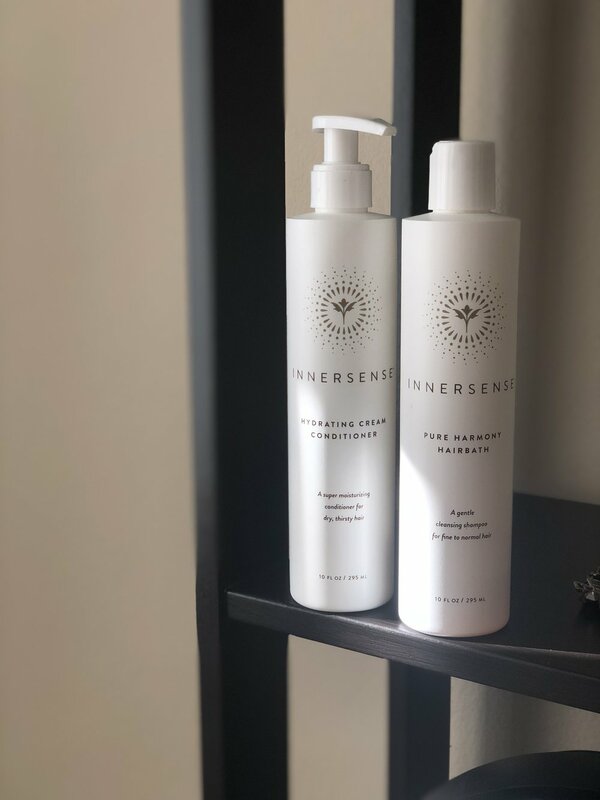 Both Brandon and I use the hairbaths, leave-in conditioner spray, the dry shampoo and we absolutely have felt a difference in how our scalps feel as well as how often we need to wash our hair. I feel like that’s saying a lot considering how different the makeup of our scalps are from one another. Body wash has always been a toss up for me until I found this vegan, cruelty-free brand of soap… that also comes in a big-fat recyclable bottle. This not only has been something my skin hasn’t reacted to, but I’ve been able to give my dogs a bath with this product too. Use it simply as a body wash, there’s not much to it. Want to learn more about the products I’m using? Shoot me a message or click on the links in this blog to go directly to the source. Like I’ve said before, I am NOT a professional, just an informed human being who was tired of accepting “this is just the way it is” and decided to do better for herself. My best advice is to try things for yourself and ask for professional help when you need it.